Our musical school was established in 1953. On present address it functions since 1985 by replacing nursery school for itself. The original choir "Marbulinek" established in 1985 practicaly contained only girls and in time of its greatest expansion the number of singers came up to 60. After 1989 the number of members started rapidly going down. In 1996 when the present choirleader Mrs. Jindrakova left the choir, it almost broke up and didn't have more than 10 members. During the leading of Mrs. Jana Dudova the choir expanded only a little but it created solid foundation for the future mixed chamber choir mostly by join of the first boys and also by major improvement of the repertoire due to "more grown up" songs and sophisticated arrangements. History of the choir under the name P.S. (Post Scriptum) starts with the first individual concert in the chapel of Liben castle on 21.9.1999. That was our last concert under the leading of Jana Dudova. At the same time it was an evening, when our new choirmaster was introduced to us - Miss Veronika Lozoviukova. Under hers leading the choir is getting bigger and better. On spring of 2005 we won a golden medal on international competition festival Festival of Song - Mundi cantant in Olomouc in category of adult chamberchoirs. In September 2005 the number of our singer has raised again and we definitely stoped to be a chamber choir. We've established a close contact with two other foreing choirs. In November 2007 we've participated in International choirs festival in Warsaw and finished on third place. In May 2007 and 2008 Post Scriptum choir performed on the final galaconcert of Slavonic spring project - Czech-Russian dialog. 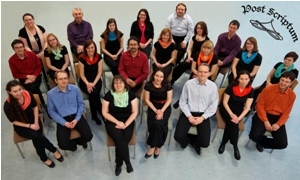 We sing mainly for pleasure, we're a group of joyful people from the age of 15 and on. We'll be very glad to see you not only on our concerts, but also on our regular rehearsals if you decide to join us. In our VISITORS BOOK you can share your experiences with us and others from our performances or a visit on our websites.